With 118 million occupied households in the U.S., that comes to $145,000 per household. But, when you consider only 74 million of the households are owner occupied and approximately 26 million of those are free and clear of mortgage debt, that leaves millions of people with in excess of $200,000 in mortgage debt. Keeping up with the Joneses has taken on a new meaning as buying a 6,000 sq ft McMansion with 3% down became the standard operating procedure for a vast swath of image conscious Americans. When you are up to your eyeballs in debt, you don’t own anything. You are living a lie. The lie was revealed as housing bubble burst and national home prices plummeted by 30%, resulting in millions of foreclosures, the worst recession since the Great Depression and homeowners equity falling to an all-time low of 38%. The Fed induced 2nd housing bubble has convinced millions to believe the lie again. The Fed easy money, Wall Street buy and rent scheme, with the FHA acting as the new purveyor of 3% down mortgages, has artificially boosted homeowners equity back to 57% just in time for the next housing collapse. Living a lie will result in more pain and suffering for those who didn’t learn the lesson last time. At least there is an asset capable of appreciation backed by the mortgage debt. Auto loans are backed by a rapidly depreciating asset, while credit card debt allows Americans to live above their means while living their lie, and student loans are the new subprime debt which will never get repaid. The country has been living a Big Lie since the day Nixon closed the gold window in 1971, eliminating any vestiges of constraint upon central bankers and politicians. The population of the US has grown by 54% since 1971, but the amount of credit card debt per person has grown by 6,782%, and the amount of auto loan debt has grown by 1,650%. Meanwhile, real median household income has grown by 8% since 1971. Replacing income with debt in order to give the appearance of wealth is nothing but a lie. It requires an ever larger amount of debt to generate an additional dollar of GDP. The exponential increase in debt became unsustainable and the Wall Street lies resulted in a global conflagration in 2008. The desperate effort by the Fed to re-inflate the debt bubble through ZIRP and QE has resulted in pathetic economic growth, while leaving willfully ignorant consumers with a record level of debt. The amount of credit card debt carried by the average household carrying this type of debt is $15,355. The amount of auto loan debt carried by the average household carrying this type of debt is $26,530. The amount of student loan debt carried by the average household carrying this type of debt is $47,712. The average household is paying more than $6,600 in interest per year, which means that roughly 9% of the average household’s income is being spent on interest alone. Credit card debt — one of the most expensive types of debt — costs consumers an average of $2,630 per year in interest, assuming an average APR of 18%. If you have the average amount of credit card debt ($15,355) and a 15% interest rate and only pay the minimum on that debt each month, it will take you more than 31 years to repay your debt and will cost you more than $18,600 in interest payments alone. The average amount of credit card debt peaked at $16,912 in 2008, fell by 14% to $14,539 by 2012 as Wall Street banks wrote off billions in bad debt, and has since risen by 6% as consumers have been lured back by the Wall Street propaganda machine. Consumers vastly underestimate or under-report how much debt they have. In fact, as of 2013, actuallender-reported credit card debt was 155% greater than borrower-reported balances. Americans are embarrassed and ashamed by their levels of consumer debt, but they can’t stop. A record number of new cars will be “sold” this year with the highest level of auto loan debt in history, the longest loan length in history, rising percentage of subprime auto loans, and an all-time high in percentage of leases. These people are underwater on their auto loan/lease the second they drive off the lot. But at least their neighbors and co-workers think their successful. Appearances are all that seem to matter in our society today. Dying in debt will be common place in the coming years. Fully 21% of Americans say they don’t think they will be able to pay off their debts — including their car, credit cards, student loans and mortgages — in their lifetime, according to a survey of more than 1,000 adults by CreditCards.com. Our debt addict society is dying of an overdose. 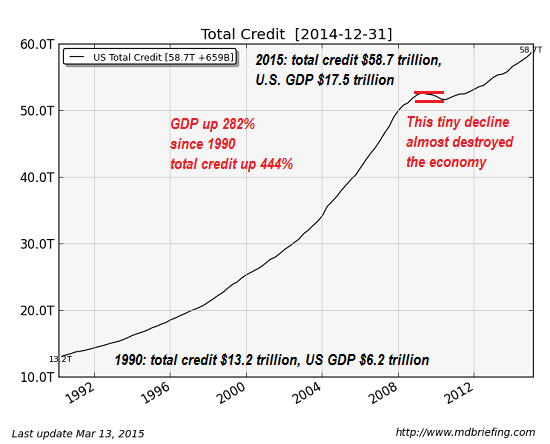 The Fed’s master plan to revive the economy with massive doses of debt has failed. Main Street America is tapped out. Decades of minimal real wage growth, relentless inflation in the things we need to live (food, rent, energy, health care), and wasting money on Chinese produced consumer crap, has left the majority of American households with little or no savings and no disposable income. This is being reflected in the pitiful economic growth and plunge in retail sales since the end of QE3 in October 2014. Our system has become dependent upon exponential debt expansion, and as soon as the spigot is turned off, our economy crashes. Bernanke chose to not voluntarily abandon the Fed’s failed credit expansion policies in 2008. The end of QE3 and the upcoming interest rate increase by Yellen will usher in financial collapse part two. There is no avoiding a collapse brought on by decades of warped monetary and fiscal policies, and irrational behavior by bankers, corporations and consumers. Even if Yellen reverses course when the economy plunges into a deep recession, catastrophe cannot be avoided. Our country has gone mad over the last few decades. We had a chance to come to our senses in 2008, wipe away the debt, liquidate the criminal Wall Street banks, prosecute the perpetrators, and reorient our economy and society back to one built upon savings and investment, rather than borrowing and consumption. It was not to be, as Bernanke and the Deep State decided their best interests trumped the interests of the people. The coming collapse hopefully will force Americans to come to their senses one by one. Video: Crisis at the US Federal Reserve, End of the Washington Consensus?